There's nothing plain about this vanilla. Pure. Organic. Exotic. Anyone who calls our vanilla "plain" just doesn't know beans. Product Notes: Simply Organic extract is made using the highest quality, Bourbon vanilla beans from Madagascar. Organic: QAI Certified Organic Kosher: KSA Certified Ingredients: Organic vanilla bean extractives in water, organic alcohol. 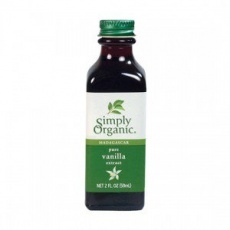 Product Notes: Simply Organic extract is made using the highest quality, Bourbon vanilla beans from Madagascar.